Penetrate, restore, and protect vinyl and rubber automotive surfaces. 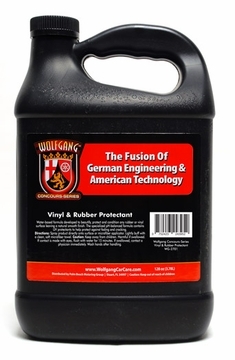 Wolfgang Vinyl & Rubber Protectant is a powerful preservative for all vinyl and rubber automotive surfaces. 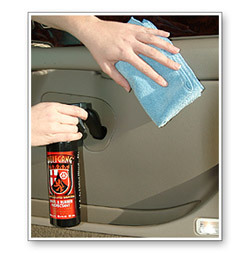 Restore and maintain the supple, smooth texture of the dash, door panels, and console with regular applications. Wolfgang Vinyl & Rubber Protectant leaves a satin, non-greasy finish that looks better than new! Ultraviolet rays are the single biggest contributor to vinyl and rubber deterioration. The windows actually magnify sunlight, accelerating discoloration, fading and cracking on the steering wheel, dash and seats. Wolfgang Vinyl & Rubber Protectant conditions and protects rubber and vinyl surfaces while powerful sunscreens block surface-drying UV rays. Vinyl and rubber surfaces remain supple and soft. Other protectant products contain petroleum distillates as their shine agent. These sit atop the vinyl as an oily, greasy film that looks and feels unnatural. These petroleum products can actually speed up drying and cracking of the top layer of vinyl over time. Wolfgang Vinyl & Rubber Protectant works differently. Wolfgang Vinyl & Rubber Protectant is a water-based conditioner that penetrates beyond the surface to help maintain pliability and integrity of rubber and vinyl. Wolfgang Vinyl & Rubber Protectant provides a natural, rich, smooth finish that lasts because it emanates from within the vinyl and rubber, rather than just sitting on top. You'll enjoy the refreshing Wolfgang signature scent lingering after you've protected your vinyl. The pH balanced, water-based formula leaves a satin, non-greasy finish that does not attract dust.� Over time, your interior surfaces will retain their color and texture, and they'll stay cleaner! Wolfgang Vinyl & Rubber Protectant is a protectant and conditioner in one.� Preserve and beautify your vehicle's interior surfaces with Wolfgang's non-greasy, UV-blocking interior surface protectant. Spray Wolfgang Vinyl & Rubber Protectant onto a microfiber applicator pad and gently wipe down interior vinyl: seats, door panels, and dash. We suggest applying it to the cloth or applicator pad rather than spraying directly, to avoid overspray onto the windows. Wolfgang Vinyl & Rubber Protectant dries to a satin, non-reflective finish. If you prefer a matte finish, simply buff surfaces with a Cobra microfiber towel. Note: Wolfgang Vinyl & Rubber Protectant dries to a satin, non-reflective finish. If you prefer a matte finish, simply buff treated surfaces lightly with a microfiber towel.